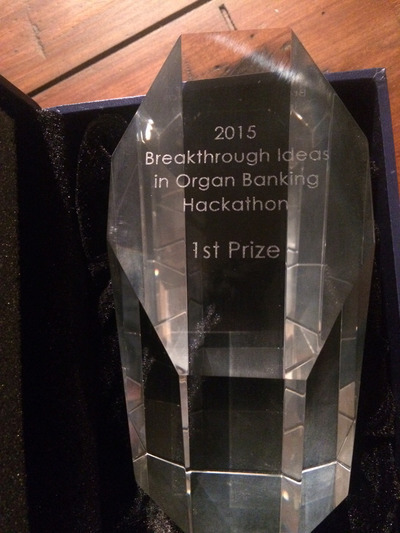 Figure 1: Trophy from the Organ Preservation Alliance's Global Organ Banking Summit hackathon competition. An initial review of our ideas where we selected one to develop further. Presentation to a selected panel of judges. Only two teams would be selected out of the eight from this round. Final presentation to the entire Summit, where all the cryobiologists present would determine the winner. Our team came up with the idea of poly-vitrification and presented the following presentation, available here: 2015-McIntyre-OPA-hackathon-presentation. Later, we wrote up a summary and published it in an abstract in the journal Cryobiology: Poly-Vitrification Abstract (http://dx.doi.org/10.1016/j.cryobiol.2015.05.062). We gave a really solid presentation and ended up winning the competition and the prize money, which we split four-ways among our group members. It was really quite a fun experience!